My totally predictable response when Greg McLaren told me his book's title was 'Stone the crows!' Anyone who knows Greg knows that in everyday life he is an extraordinary punster. So he kind of asked for it. I guess that in order to be a persistent punster you also have to know correct English - so Greg is pedantic about the local, familiar, big shiny blue-black birds in calling his book Australian ravens - of course, 'Australian ravings' is another really far-too-obvious paranomasia any fun-loving poetry fan might make. there is a word I meant to say. to move wholly around it. In earlier poems in the collection Greg revisits the Cessnock region of the Hunter Valley, where he grew up. He checks the google map of his past and recalls friends - boys with specks of coal on their skin having a lark smashing bottles and riding bmx bikes in old quarries - these kids either out of touch now, or dead. and stayed out of trouble. siphoned out of Swansea like a euphemism. 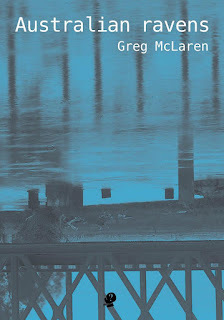 Greg's poems are for and about friends, family, other poets, Peter Kirkpatrick, Bruce Beaver, about the wondrous stuff that's on the everyday ordinary boulevard like, say, New Canterbury Road. He's been reading Dogen Zenji, the 13th century Japanese Buddhist priest who was disappointed in Kyoto's Buddhism & so, went to China for five years, to seek out a more authentic Buddhism. for my friend the priest. There is another incredibly various set of connected poems set in the outback, in Broken Hill, Silverton and surrounds. These poems are atmospheric yet detailed, they're crammed with imagery, attitude, folklore, and elegant description of a mass of things - the old diggings of mining towns and ghost towns and their popular culture - the Mad Max movies, saltbush shrubs in a cemetery. It's dry, it's colourful, it's totally recognizable. It's a travelogue, an outback adventure, a road poem complete with bugs all over the windscreen. It's a visual panoply, it's a mixture of myth, recombination and revision, and it's brilliant. This leads into a final section called 'The Blue Gum' - which Greg says he wrote under the influence of Laurie Duggan's 'Blue Hills'. The sequence begins with a kind of ode to the Sydney blue gum - that great aromatic eucalypt that gives the haze to places like the Blue Mountains. of cities they hate to go to. In the end the memorably unsettling situations in the Blue Gum poems are redeemed by contemporary love, a new life, a new born. La Vita Nuova in the inner west. So - Australian ravens is actually quite wonderful. The poems don't need me to analyse or endorse them (though I do!). We can read and think and enjoy and savour and be disturbed, enriched and surprised by them. crows analogical reasoning December 2014 issue of Current Biology.